In order to comply with Massachusetts General Laws, Chapter 149, Sections 54 – 105, all officials must reach the age of 14 prior to being allowed to officiate USA Hockey games within the Massachusetts District. In addition, all officials age 14 to 17 must submit the proper documentation to the league(s) they work for prior to being assigned any games. M.G.L. Chapter 149 also restricts officials age 14 to 17 on the number of hours they can work in a day and the times of day they are allowed to officiate. As part of Hockey Week Across America, 18 NHL games in American cities will offer two young officials the chance to meet the NHL officials working the particular contest prior to the game and then stay to watch those NHL officials in action. Special thanks to the Boston Bruins and the NHLOA for hosting Jack Hudson from MA and Dean Simpson from the NE District at the Bruins game on February 28th. Manage and help to control games in cooperation with the coaches to provide a positive and safe experience for all participants. Adopt a “zero tolerance” attitude toward verbal or physical abuse. Never openly criticize a coach, player or fellow official. Everyone in hockey wants the game to be played within the rules. More importantly, they want those who fail to do so to be held accountable for their actions. As a result, USA Hockey has spent the past several seasons making appropriate consequences for the rule-breakers, including more severe penalties for dangerous actions and progressive suspensions for repeat offenders. And while officials can’t prevent the dangerous action from occurring, they do play a significant role in holding accountable those responsible for these actions with proper rule enforcement. Not only that, but officials must fulfill their responsibility of submitting an accurate and timely game report through the USA Hockey Online Game Reporting System. STRIPES recently sat down with Matt Leaf, director of the officiating education program, to learn more about the game reporting process and to address some of the concerns he hears from affiliate disciplinary personnel on the reporting process and what officials can do better. STRIPES: The Online Game Reporting System is in its fifth season, what are some of the areas where the system has helped the game? Matt Leaf: When properly used, the system has definitely helped affiliates and local leagues manage suspensions and the disciplinary process. It allows for a consistent game-reporting format where the required information immediately gets into the hands of the proper authorities once submitted by the official. The system also provides a more user-friendly mechanism for the officials to file the report on their mobile devices. One other benefit is, with better compliance in filing reports each season, USA Hockey can track certain infractions and identify any trends both geographically and by types of infractions. STRIPES: How is USA Hockey looking to continue to improve the system and make it even easier for the officials? Leaf: We are constantly receiving feedback from affiliate administrators and officials with suggestions, and all of that is taken seriously. In some cases, there are good ideas that we try to incorporate as soon as possible. In other situations, a bigger picture needs to be taken into consideration. One main area that we are working on is the player search component and tying that into team rosters so officials can simply pull down the team roster to identify the player versus trying to narrow down an entire database. Doing so will greatly improve the accuracy of identifying the guilty player/coach and simplify the process for officials. The second area that is being worked on is the reporting side of things for administrators and making penalty data more readily available – basically simplifying their ability to manage hundreds of reports. STRIPES: What is the official’s responsibility when it comes to submitting game reports? Leaf: First and foremost, with the new progressive suspension rules, the official has to be timely in submitting reports so the system can identify any players/coaches who have reached a suspension threshold. Timely should be well within 24 hours of the game, but certainly no longer than 48 hours (the sooner part of this option being preferred). Next, it is imperative that the official pays attention to details and provides accurate information in regards to the player(s)/coaches involved (e.g., the type of penalty assessed and the proper rule reference). There really is no excuse for an official to submit a report for clicking on a minor plus misconduct for head contact when in fact they assessed a major plus game misconduct. The correct rule reference is also important as it does play a role in the system’s ability to track repeat offenders. STRIPES: That seems to be pretty critical information. What are some other things officials need to know when submitting a game report? Leaf: The most common mistake made is when an official submits a duplicate report (or maybe both officials submit a report) for the same incident. This creates problems because the system does not know it is a duplicate, so it counts it as two different strikes against the same player, even though it was only one infraction. Only one report (the officials can work on it together, if needed) needs to submitted for each incident. Another common error is submitting multiple reports from the same game when, in fact, the system is designed to handle multiple incidents involving multiple players from the same game. Instead of starting over with a new report for each penalty assessed, the officials can simply do one report for the game and identify each incident separately in the one report. Finally, officials have to know the rules and the consequences for the rules. Under Rule 411 (Progressive Suspensions), there is a full listing of infractions involving major penalties that require a report to be submitted. Each penalty also has to be listed separately. For example, a player gets a major penalty for slashing, and then later on, gets a major plus game misconduct for head contact. It’s not enough to simply submit a report assessing a game misconduct for the second major penalty in the same game. The report needs to have each penalty (slashing, head contact, game misconduct for second major) listed separately so the system can properly track the aggressive fouls and send out the automatic alert when a threshold is reached. STRIPES: Any other final words of wisdom? Leaf: USA Hockey wants players and coaches held accountable for their actions, whether it is for unsportsmanlike behavior or dangerous play outside the boundaries established the rules. This can’t be accomplished without the help of the officials properly enforcing the rules and submitting the appropriate game report when needed. Officials have a responsibility (in fact it is part of their duties) to properly submit accurate game reports when required. Detailed instructions on filing game reports are available on USAHockey.com, and if unsure on something, ask your local supervisor or assignor. Paying attention to details in submitting a timely and accurate report will not only minimize confusion and having to answer questions later, but also will eliminate having suspensions overturned on technical issues and will, ultimately, hold those who tarnish the game with their behavior accountable for their actions. Whether it’s Zach Parise’s work ethic or Patrick Kane’s puck skills, young players love emulating their favorite pro players. So if a young goalie has the chance to wear the same mask as world-renowned goalies such as Henrik Lundqvist, he or she will likely jump at the opportunity. Unfortunately, certain masks could jeopardize their safety and their team. Cat eye masks, which gained popularity through their use by professional goaltenders, are illegal for youth and high school players. The masks lack certification by HECC (Hockey Equipment Certification Council) as required by USA Hockey because the larger eye openings expose young goaltenders’ eyes to stick contact. Since cat eye masks have been restricted at the youth levels, manufacturers have developed a modified cat eye mask which meets HECC standards and is approved for play. The mask is considered safe for goalies to use, but they also create confusion between which masks can be used. The chart below outlines the three most common types of goalie masks. Coaches, parents and referees are encouraged to educate themselves on the differences between the various types of goalie masks on the market. The safest way to find a legal mask is to look for a valid HECC certification sticker on the mask and helmet. A player is skating toward the opposing net, takes a shot and falls down sliding toward the net. His momentum carries him in to the goal keeper, knocking the puck loose and in to the net. The goal keeper did not have possession long enough for the play to be blown dead. Is this a good goal? The general rule is a puck must be propelled into the goal by a stick. Which means a player may not knock the puck into the goal by making contact with the goalkeeper after he/she makes a save. In a squirt game the puck is next to the goalie’s leg pad and the other team is trying to hit it in but instead of hitting the puck they are hitting the goalie. Do you blow the whistle even though the puck is not covered? The officials should stop play if they determine that the goalkeeper has control of the puck (or has covered the puck) while the attacking team is applying direct offensive pressure. If the puck is loose, play should be allowed to continue. However,attacking players may not slash or make any type of illegal stick-contact with the goalkeeper just because they are “trying to play the puck”. Players are expected to control their sticks at all times, and any type of dangerous,reckless, or illegal stick contact with goalkeepers should be penalized. A player (Youth, Girls’ or High School) is assessed a minor plus a misconduct penalty. Does this infraction count as one or two penalties toward the cumulative penalty rule? Two. Rule Reference 401(b). Even though there has been only one infraction of the rules, there are two penalties assessed for this infraction that both count towards the cumulative penalty rule. You need to have the new Crest on your sweater! If it’s not blue, no games for you! What degree of force is necessary in order to be considered to be thrown dangerously into the boards? For USA Hockey youth games, the onus is on the player delivering the check to do so in a manner that does not place the opponent in danger. Rule Reference 603(Note). The purpose of a body check is to separate the opponent from the puck. Anytime a player delivers a check for the purpose of intimidating or punishing the opponent, and therefore causes the opponent to be driven excessively into the boards (uses the boards to punish the opponent), a boarding penalty must be assessed. The degree of force with the boards is certainly subject to discretion and a more practical question may be “was the check necessary and/or what was the vulnerability of the player being checked?” For example, a boarding penalty may be assessed when a player was not necessarily hit that hard,but was in a vulnerable position when unnecessarily hit with a degree of force that caused them to be thrown into the boards excessively. In contrast, a penalty may not be warranted when a player is hit much harder, but his preparedness for the hit causes him to go only mildly into the boards. USA Hockey is not eliminating a good, hard and clean check. However, players must be aware of the situation when delivering a check and then held accountable for taking “liberties” and therefore endangering an opponent. A player is skating behind an opponent as they head towards the end boards. At the bottom of end zone face-off circle, the trailing player trips the opponent and causes him to lose control and crash into the end boards. May a boarding penalty be called in this instance? The boarding rule covers all potential illegal actions that causes an opponent to dangerously contact the boards. Even though a tripping penalty may also be appropriate, the boarding call is preferred to draw attention to the more aggressive infraction. What is the USA Hockey interpretation of illegal body checking to a player who is no longer in possession and control of the puck? Any avoidable check delivered to a player who is no longer in possession and control of the puck. Rule Reference 640(b). A player is considered to still be in possession of the puck after he releases it up until the point the puck is next played by another player. An avoidable check delivered to a player after he has released the puck must be penalized under this rule. An avoidable check is when the player delivering the check has an opportunity to avoid contact once it is realized the opponent no longer has possession and control of the puck. The concept of “finishing the check” is one that is meant to intimidate or punish the opponent and has no place in youth hockey. Provided this check is avoidable, it must be penalized in every instance. **NOTE** Roughing is NOT a substitute for a Boarding call, please make the proper call! Returning officials have 5 days to complete their requirements for the 18/19 season AND have their new crest on their sweater. An attacking or defending player in an end zone shoots the puck into the Neutral Zone. The puck hits an Official in the Neutral Zone and deflects off the Official back into the end zone while an attacking player is still in the Attacking Zone. Where is the ensuing face-off? At the point of deflection. Rule Reference 630(b). Any deflection, whether off a teammate, an opponent, an Official, or the boards or glass creating an off-side situation at the blue line, must be treated as such. Officials must always strive to position themselves in such a manner that would allow the puck to leave the zone before striking them, thereby creating the off-side situation. During the course of play, a goaltender loses his stick. His defensemen picks up the goaltenders stick while in possession of his own stick; in the process of returning the stick to the goaltender, the defensemen plays the puck, is this a legal play? A minor penalty for an equipment violation shall be assessed to a player or goalkeeper who participates in the play while he is in possession of more than one stick, except that no penalty shall be assessed to a player who is accidentally struck by the puck while he is carrying a replacement stick to a teammate. During the course of the game the referee is notified that Players or Team Officials that have received a previous suspension are participating in the game. These players did not sit out or fulfill their obligated suspension time. Should the referee penalize the offending team? The referee may not be aware of the time period that has taken place between games and therefore cannot enforce suspensions to Players or Team Officials. The referee is required to report the incident to the proper authorities for further review. Returning officials need complete their requirements for the 18/19 season AND have their new crest on their sweater by December 1st. The attacking team is in possession of the puck in the Attacking Zone and the puck is passed back to the blue line. The puck stops on the blue line, then is shot back again. Has an off-sides infraction occurred? The puck would have had to completely cross the blue line before being shot back into the Attacking Zone for an off-side to occur. A defending player throws his stick along the ice at an attacking player in possession and control of the puck. The attacking player is in his Attacking Zone when the stick is thrown. The stick does not hit the puck or the player, but the player loses possession of the puck. Is a penalty shot to be awarded? Yes. The offended team has a penalty shot/optional minor penalty option. Rule Reference 637(a). When a defending player throws his stick in the direction of the puck that is in his Defending Zone, a penalty shot must be awarded. In this situation the Referee cannot be expected to determine whether the stick caused the attacking player to lose his concentration or if he lost possession by his own actions. A player on the ice makes physical contact with an Official following a decision made by that Official. What penalty or penalties shall be assessed? A misconduct, game misconduct or match penalty, depending on the severity of the offense. Rule References 601(d.1, e.4 and f.1). The officials must be able to distinguish between the severity of the contact and the intent of the player in order to assess the appropriate penalty. Simply touching an official does not constitute a physical assault calling for a match penalty. To those in uniform serving today and to those who have served in the past, we honor you today and every day. What would be examples of an infraction warranting a major penalty for hooking? 1) A player is hooked around the waist, and the offending player is able to steer the opponent violently into the boards or goal frame. 2) A player is hooked between the legs and the offending player uses the blade of the stick to punish the opponent (AKA cup check). This could also be penalized under Spearing if the toe of the blade is used. In both situations, a Game Report is required. What does the word “participate” mean in reference to a player who participates in play with a broken stick? “Participate” shall mean playing or attempting to play the puck, body-checking or attempting to body-check an opponent, or continuing any action that directly affects the play. Rule Reference 605(a). A player may carry a broken stick to his players’ bench only if he is in the immediate vicinity of the bench, is completely out of the play and does so immediately upon breaking the stick. You have 18 days left to complete your requirements for the 18/19 season, don’t wait! Have a question that you’d like to see answered here? Knowledge that you’d like to share? Just hit reply, we’d love to hear from you. Have you as an official been placed in a situation that you feel was not resolved to your satisfaction? We can help you. We are here to support you. Abuse by a player or coach is never acceptable, we have your back. Click reply, and we’ll do what we can to help. click reply to this email with the details. 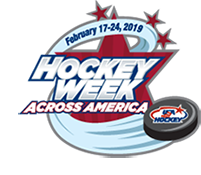 On February 22-24, 2019 USA Hockey will celebrate the 12th Anniversary of Hockey Weekend Across America. This weekend is a special time when all of our membership (players, parents, coaches and officials) take time to celebrate everything great about ice hockey in America. As in the past, the USA Hockey Officiating Program will be collaborating with the National Hockey League and National Hockey League Officials Association to offer the “Meet the NHL Officials” program. 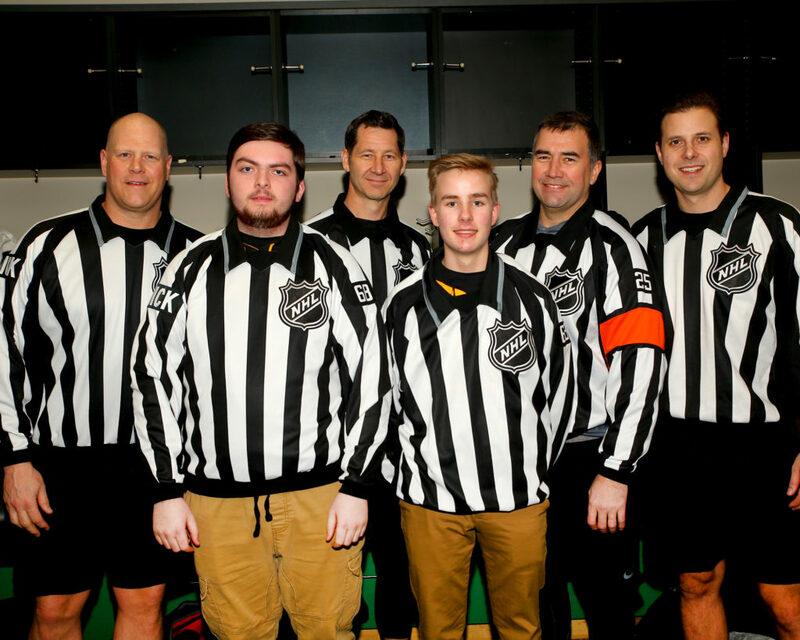 This unique program will give a handful of young grassroots officials the opportunity to attend an NHL game and meet the game officials in their dressing room. Do you know an official you would like to nominate for this program? For more information regarding this program and instructions to nominate an official in your area, please click the link below, www.usahockey.com/hockeyweekend.